Easily help your students reflect on their math strategies and move their thinking from computation to problem solving! 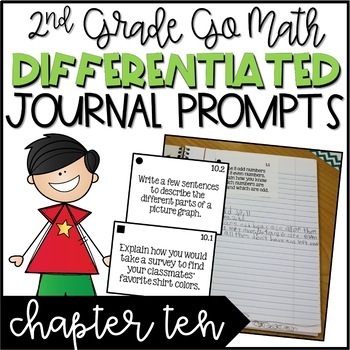 These math journal prompts are already differentiated for Go Math Chapter 10: Data, and will challenge your students to write about the math processes and strategies they are using. Check out my blog post on how I use these journal prompts in my own classroom! This pack correlates with the 2nd Grade Go Math curriculum. It contains 2 different journal prompts for each lesson. 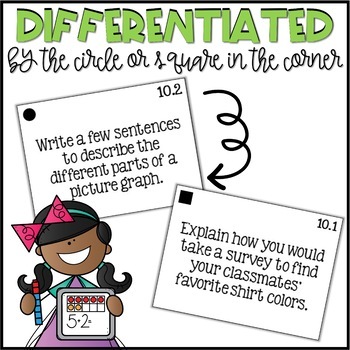 Prompts are differentiated by the circle and square in the upper left-hand corner. A circle prompt is for struggling or on-level students. A square prompt is great for students who need an extra challenge. 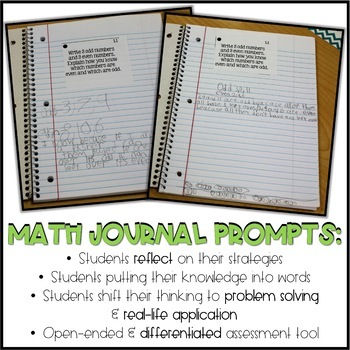 These journal prompts challenge students to really write about the math processes they are using. It is a GREAT tool for you to use to see how students are understanding a concept! Save 20% by purchasing the BUNDLE here!!! !